Though somewhat unassuming in looks, this building is refined and multi-faceted. The simple blue façade is contrasted by coloured projecting elements and partially inset balconies. The five floors and attic feature 18 apartments ranging from 42-111 square meters. The L-shaped building is mostly barrier-free with walk-in showers and some wide-format doors. On the ground floor, a large storefront with inviting windows offers an opportunity for a wide range of businesses. Enjoy peace and sunlight inside cultivated green gardens away from the street in the redesigned and replanted inner courtyard. 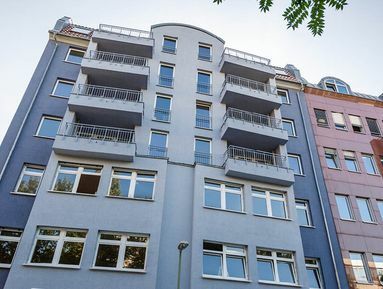 This is a compact single apartment east of the trendy Friedrichshain district, which has a lot to offer. Currently well rented, it offers an attractive layout in which you feel comfortable right away. This is thanks to the large combined living-bedroom with a row of windows to the south and the bright kitchenette, as well as a bright, naturally-lit bathroom with shower. The result: living with a feel-good factor. This is a tremendous location, in a hugely popular part of the city. Whether you’re seeking the chicness of Mitte or the cosy atmosphere of Kreuzberg – you’ll find everything you could need here. From the Turkish Market to organic food stores, from the party scene to idyllic retreats, from street art to renowned galleries, Kreuzberg has it all. The finest shopping areas, the most beautiful squares, and the majority of Berlin’s tourist attractions can be found nearby in neighbouring Mitte. Not far from the river Spree, the building also has several relaxing, green oases nearby. The local population is international and educated, and the youngest in the city.